A Tesla crashed into the back of a bright red firetruck on Interstate 405 in Culver City California yesterday. Luckily, the driver and first responders were not injured, but the Tesla was clearly a total loss. 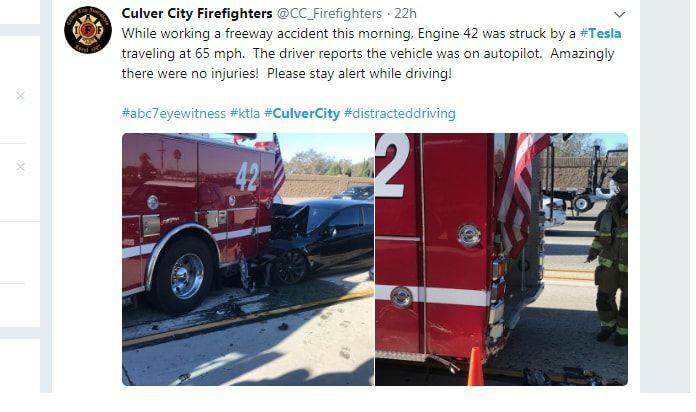 What makes the story newsworthy is that the Culver City Firefighters Local 1927 tweeted that the driver of the Tesla Model S reported that the luxury electric car was traveling in Autopilot mode when it struck the un-moving huge, red firetruck. This accident sounds eerily similar to a deadly crash in which a Tesla on Autopilot struck a huge white semi-trailer in its path. In that crash, the NTSB pinned some of the blame on the Tesla Autopilot system. CBS Local Los Angeles reports that firefighters say the driver said the vehicle was operating on Autopilot self-driving mode when the accident occurred. Tesla, Inc. likes to remind owners, drivers, and fans of the Tesla models equipped with Autopilot that the system is not a level five autonomous driving system, but rather one which aids driving. It requires the driver stay engaged in the operation of the vehicle at all times. Firefighters and the news media have not reported the exact model of the Tesla in the crash. From the images available it appears as if the sedan is a Model S.
Coincidental to this first responder report of a Tesla crashing on Autopilot, police in Northern California reported this week that a driver they arrested for suspected drunk driving told them the Tesla he was in was operating on Autopilot.